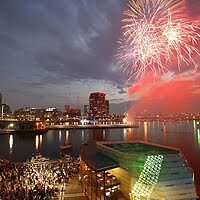 Just 50 Days until December fun in Docklands! Functions, Christmas Lunch & New Years Eve! Only 50 days left until the busiest month of the year hits! December is rapidly approaching- think work breakups, functions, presents, Christmas lunch and New years! Beat the busy last minute rush and plan ahead for lots of festive fun in December at Docklands! A variety of function rooms are available at Docklands for private events or intimate group bookings for over 20 people. Join the Platinum Club and take advantage of 10% off the cost of your next function or event at participating venues- perfect for Christmas Parties and work break-ups! Looking for somewhere special to spend Christmas Day Lunch? Picture a sensational selection of quality restaurants and picturesque water views - you can't go wrong! Here’s a few great options- Take a look at what’s available and be sure to find something to suit every family or group of friends, small or large! - Livebait: Indulge in Melbourne’s best water & city views while enjoying a delicious three course seafood inspired menu. - Grill 66: Located right on the water, enjoy some of Melbourne’s most unique waterfront views complete with a three course lunch. Welcome the new year in style with sensational food, amazing entertainment and a front row seat to the waterfront fireworks displays! Click here to find the venue perfect for you and friends! Remember to visit docklandsmelbourne.com.au to stay up to date with all the latest events & specials at Docklands!